Step aboard one of three Oasis Class ships — Oasis of the Seas®, Allure of the Seas® or Harmony of the Seas® — and you’ll be immersed in a floating city at sea where seven distinctive neighborhoods truly offer something for everyone. 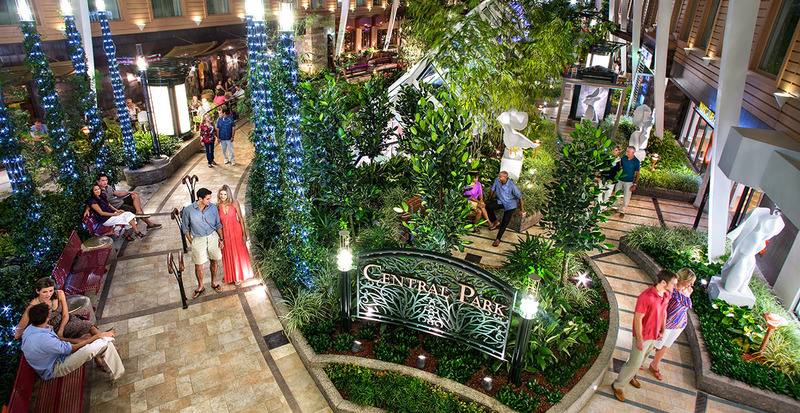 Nowhere else in the world can you spend a day strolling a Boardwalk and leafy Central Park, choose between designer shopping or zipping down an enormous waterslide, and dining in a different restaurant every night before taking in a Broadway show. Intrigued by all that awaits on board? Check out this video about the many adventures you’ll have at sea. Choose from seven neighborhoods for endless adventures! Stroll down the scenic pathways of Central Park shaded by an astonishing 12,000 seasonal flowers and canopy trees. Make it a date night as you pop into an art gallery, indulge in an intimate dinner of modern cuisine at 150 Central Park and head to the spectacular Dazzles dance club, spanning three decks with floor-to-ceiling views. Added Perk: Reserve your balcony stateroom overlooking Central Park and receive complimentary EAT • DRINK • PLAY amenities: lunch at a specialty restaurant, a welcome bottle of red wine and private casino gaming lessons. Shopping and entertainment take on a state-of-the-art spin on the Royal Promenade, beginning with the Rising Tide Bar, the world’s first moving bar at sea that transports you here straight from Central Park while you simply sit back and enjoy a cocktail. You’ll spy more surprising elements like the Atlas Bridge, a copper globe that cracks open thanks to a hydraulic system. Or, escape for some family fun at a festive parade along the Promenade, starring a whimsical cast of colorful characters (including your favorite Penguins of "Madagascar"). 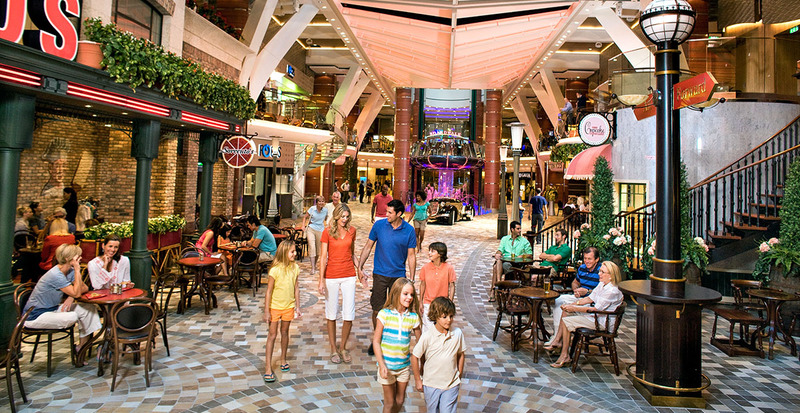 Endless family fun brings together every generation on the Boardwalk. Careen nine stories above the Boardwalk on a high-flying zip line ride that takes you over the animated streets of this carnival at sea. Take a spin on the colorful carousel and sample your favorite sweets at Candy Beach before heading to the AquaTheater for an acrobatic spectacular performance sure to leave a splashing impression. Added Perk: Let us reserve your stateroom overlooking the Boardwalk and enjoy complimentary EAT • DRINK • PLAY extras: lunch for four at Johnny Rockets®, unlimited soft drinks for two and family time on the rock climbing wall. 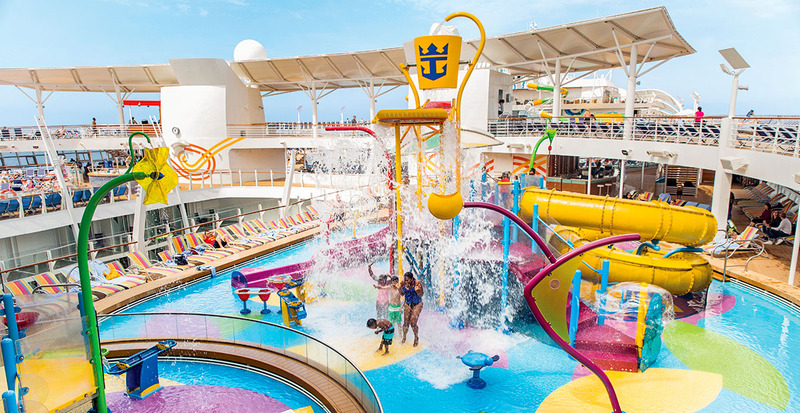 Splash all day in this fun-filled zone that stretches the length of Deck 15, complete with four unique pools. Let the kids ride the waves of the FlowRider® and race up the rock wall, while you sink into the relaxing rhythms of the adults-only Solarium pool hanging 136 feet above the waves. Aboard Harmony of the Seas®, you'll get soaked on the slides and waterfalls of Splashaway Bay, tackle a trio of slides at the Perfect Storm and test your nerves on the tallest slide at sea, the Ultimate Abyss. Get your heart pumping with the latest cardio and resistance equipment or join in on a kickboxing or yoga class offered in the state-of-the-art fitness center. Vitality Spa & Fitness will relax and rejuvenate with a soothing Elemis aroma stone therapy treatment while the kids enjoy pampering of their own at YSPA. The amusement never stops in Entertainment Place. 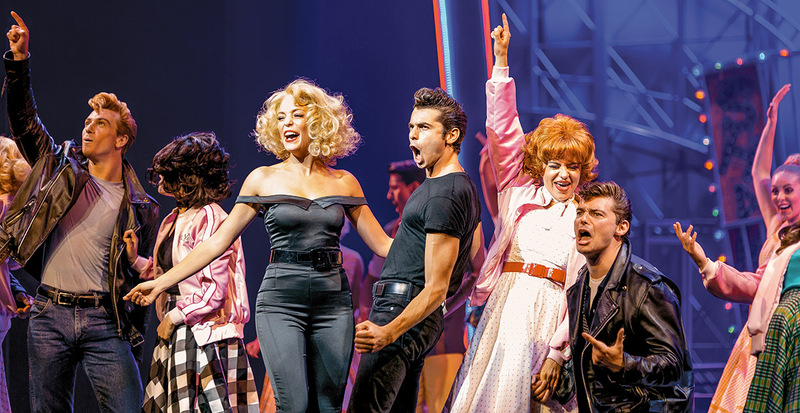 Sing along with Sandy and Danny in “Grease,” the latest hit Broadway musical to hit the seas, or take in other legendary favorites such as “CATS, The Musical” and the global smash “MAMMA MIA!” Comedy and music round out your evenings. Marvel over athletes elegantly twisting and twirling in evening ice-skating performances and make it a night for the grown-ups at the dazzling casino. 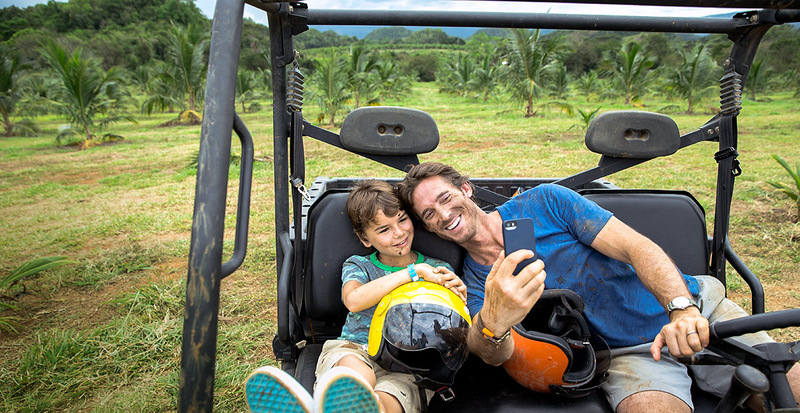 Rest assured young ones — from babies to teens — are expertly supervised on their own cruise adventures. 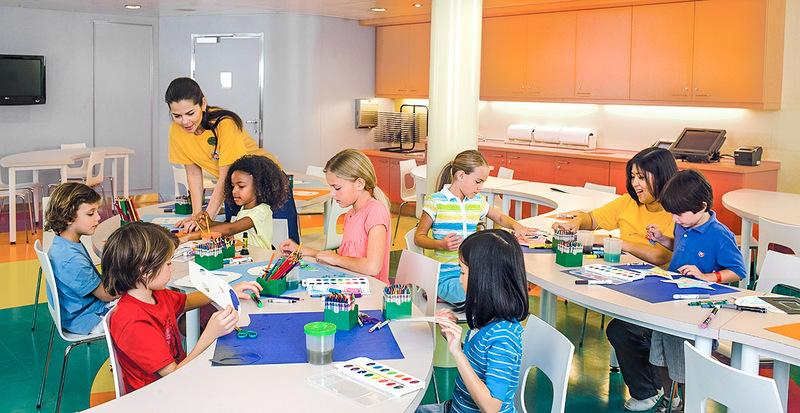 Your little Picasso will enjoy a world of color with Adventure Art by Crayola in the Imagination Studio, while young Einsteins expand their knowledge in the Adventure Science Lab. 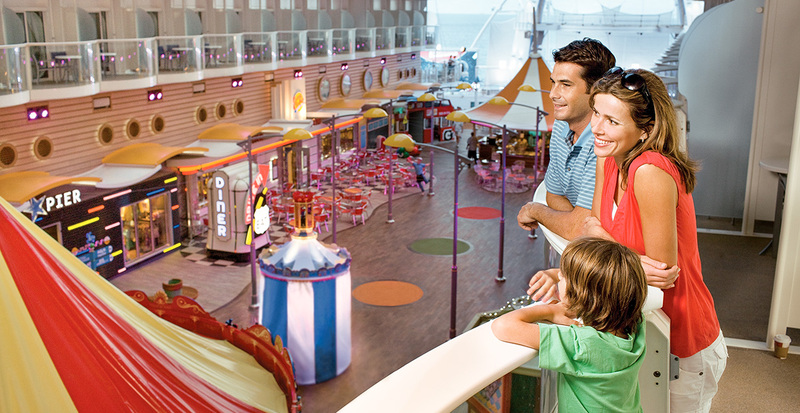 Join together for some family fun as you create a scrapbook of your amazing voyage. Teens enjoy freedom in their own spaces, plus hosted gatherings from pool parties and scavenger hunts to evening dance parties and karaoke. 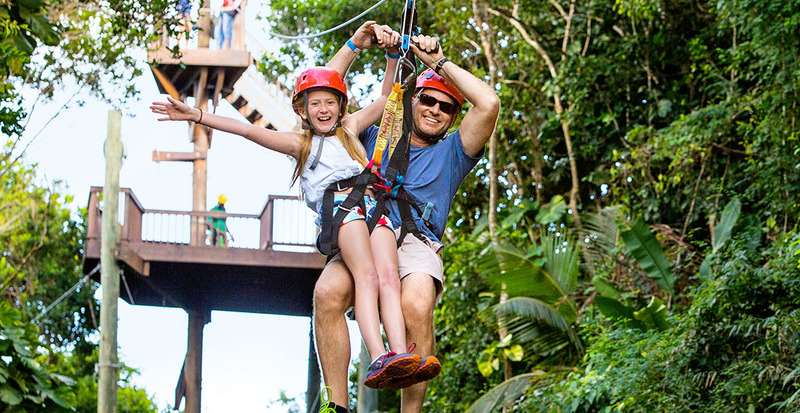 Set sail with the family from Port Canaveral and Fort Lauderdale, Florida, on journeys that encompass the grand allure of the Caribbean Sea, from the western waters of Cozumel, Mexico, to the eastern shores of Basseterre, St. Kitts. 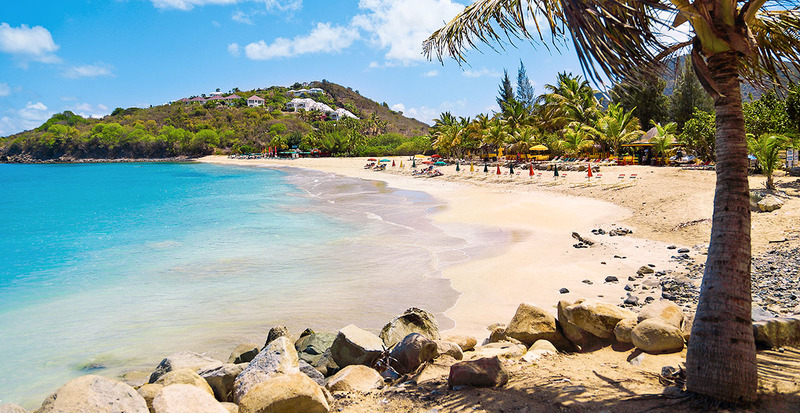 We’ll plan a stay on board an Oasis Class ship that befits your every desire, helping you create the ultimate Caribbean voyage.